There’s never been a better time to consider an engineering apprenticeship with John Deere. As the agricultural and turf machinery business becomes more technologically advanced, utilising satellite navigation systems, Formula 1 transmission technology, computerised controls and advanced, fuel-efficient engines, the need for skilled people working in the industry becomes ever greater. It’s not just about the machines either. Sophisticated parts and service systems require the same skills too. The John Deere dealer of tomorrow is a challenging business, with a wide range of opportunities and exciting prospects for the right people. Whatever your interest, there is a role for you. Like all apprenticeships, the John Deere service technician and parts support schemes combine training with paid employment, leading to nationally recognised and valued qualifications. Apprentices work at a John Deere dealership but also spend eight weeks each year at Babcock International Group’s Ruddington Training Academy and at John Deere’s headquarters, both near Nottingham. You are supported by a designated learning adviser and by the employing dealer, gaining valuable workplace skills by undertaking practical tasks and experiencing real-life challenges. Every apprentice is provided with an individually tailored learning plan, with progress monitored by the learning adviser who makes regular visits to the dealer for on-the-job assessment and guidance. John Deere offers three different apprenticeship programmes, leading to different career paths. You can choose Ag Tech, Turf Tech or Parts Tech. This turf engineering apprenticeship develops exactly the same skills as its agricultural equivalent, but with the focus more on machines used by golf courses, sports grounds, local authorities, landscapers and country estates. 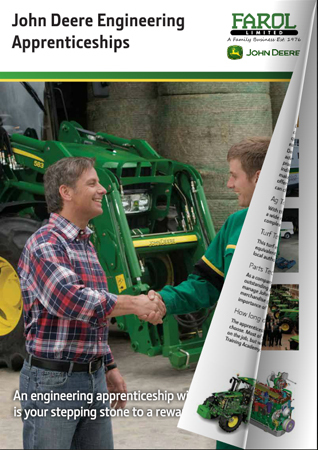 As a company John Deere is renowned not just for its machinery, but also for its outstanding parts and service support. This apprenticeship concentrates on how to manage John Deere’s sophisticated parts systems, run a profitable retail environment, merchandise goods effectively, and understand the value of John Deere products and the importance of selling on quality rather than on price. The apprenticeship programmes last for two to four years, depending on the course you choose. Most of your time is spent employed at a John Deere dealership where you learn on the job, but with the added benefit of some classroom and workshop tuition at the Training Academy.